I am a retired soldier. On 21 June 2005, I was wounded by a roadside bomb while on a foot patrol in Baqubah, Iraq. I lost part of my left hand, full use of both hands, my eardrums, and large patches of skin on my legs and arms. The list of injuries is far longer, but to tell you how bad it was, I died twice on the way to Walter Reed. I spent many months in the hospital trying to get well enough to return to duty, which I eventually did, and went on to serve an additional 10 years, retiring in January of 2015. In 2006, my spouse bought me a Labrador retriever as a present when I was promoted to Major. She had my Brother in Law pick him out. David is an extremely gifted dog trainer who works in Jeffersonville, Indiana, at Duffy's Dog Training Center. He selected my dog from a litter based on the dog;s aptitude for learning, and because he could see that the dog was going to be an absolute tank--strong and able to help me with anything I could imagine. I let my two kids name the dog, and they chose "Major" honoring my recent promotion. For the next year, Major and I bonded over daily walks (which we BOTH had to do, as I was still in physical therapy) and through learning both good house behaviors as well as good canine citizen behaviors. Major also took up his own tasks, which I didn't realize he was doing for some time. Major would brace me going up and down stairs, always staying by my side and giving me an anchor (I get "wobbly" sometimes, because my ears/balance ain't what they used to be) in case I lost my balance. He would force me to give him attention, when I was getting upset or angry., just by sitting in front of me and putting his head in my lap. Major would find ways and means of taking care of me--by retrieving things I'd dropped; by guarding me at night and giving me a feeling of safety, by waking me up when I was having nightmares. Some of this was trained behaviors, and some of it he just did. We had a very, very special bond. Major became, most accidentally, my first service dog. Major and I were together through thick and thin, until the Army forced us apart--I received orders to deploy to Afghanistan in 2011. While I was there, my wife sent me a message on day near Christmas--"Honey, Major is sick, I need you to call me." My heart sank, Carren has been with me through thick and thin, and KNOWS what rates a "call me ASAP" message when I am deployed... and none of those reasons mean something good. I called as soon as I could. Major was in the hospital. His liver was failing. He would need a liver transplant to survive, and that was not a guarantee. Even if he did survive, he'd always be very weak, and would likely on live a few years. A transplant would cost us over $10k, and just wasn't in the cards for us... I had to let him go. When I returned home from deployment, I puttered around for a bit, worked and spent time with my family, but there was a huge hole in my life. I searched my feelings and realized that not only did I miss Major, but that I was ready to begin again, selecting and training another service dog. I found a Labrador Breeder who happened to have a litter ready, and we went for a visit. Greeting the pups for the first time was a joy--eight little balls of floof, all SO excited to see me! I gave many pets and got many licks. One pup, a tubby little butterball girl, kept attacking my sandaled feet and chewing on my toes. I'd pick her up and hold her, she'd calm down, I'd set her down to go be with her litter, and she'd be right back on my toes. She made it pretty clear, She'd chosen me, and that was that. We named her Halia. I was stationed in Hawaii, and she was born on the Big Island, so we thought a Hawaiian name was appropriate. Halia means "in memory of a loved one." It seemed fitting, as the wound from losing Major was still so fresh, and I was going to become as close to her as I was to him. Halia took to training like a Lab takes to water. She learned to be an anchor, she learned how to behave in public, at work, around other dogs, at the airport and on and off lead. She learned commands and stays absolutely focused on me, despite what is going on around her. She's been on planes, trains, and in automobiles (she prefers golf carts.) She's been in hospitals and churches and every other public space you can think of without incident. She wakes me from bad dreams, cuddles (not as easy as you'd think with a 70 pound dog) when I'm down, and keeps me steady when I walk. She brings me things--mostly to see if I'll throw them for her. She even swims with me--including going down a waterslide that almost got us kicked out of the pool at a resort... but we had fun! When the time came to retire from the Army, I had to consider what I was going to do with the rest of my life. Between my 22 year retirement and VA disability, I could afford a mortgage and keep the kids fed and clothed, and if Carren doesn't work (she's a social worker) she kind of goes a little crazy... likely from too much exposure to me. I thought about my post-Army life and I had an epiphany: What I really, truly wanted to do was breed labradors. I didn't want to breed them to become the world's next AKC Champion breeder, or to breed them to win Hunting and Field trials, but to breed them for a singular purpose: to serve as service dogs. You see, not every dog has the aptitude for service dog training. Not every dog has the drive, the focus, or even the intelligence. (Trust me, I have a black lab named "Tonto" who is, for all intents and purposes, dumb as paste. Many service dog programs go to animal rescues and shelters looking for dogs that can become service dogs, but it's fairly rare they find the dogs they need. That was the genesis for Hero Labradors. I am breeding Labradors, and selecting for qualities and traits specifically for service. While a show breeder is selecting for conformation--coat, head size, color, height, etc., and a field breeder is selecting for prey drive, athleticism, and long legs/narrower body, a service dog has different needs. Service dogs need intelligence, they need focus and a desire to serve and learn. You can't train them with harsh methods to do their service, they have to WANT to please. They can't be alpha dogs, because they have to take cues from their handler. They can't be Omegas either, because they need to assert themselves when it's required. Service dogs need to be Betas: They submit to their handler, but no one else (when working) and are confident and assured in new surroundings. They take things as they come, but are still vigilant and watchful over their handler. So I looked. I looked for service dog breeding programs and I found... nothing. I found many breeders who would donate to training programs, and many training programs who would train dogs for Wounded/Disabled veterans and first responders, but I looked high and low and couldn't find any breeders who were selecting for the exact traits that a service dog needs to possess at a very early age. So I decided if it wasn't happening, I was going to make it happen. I've had to relearn how to walk, how hard can it be compared to that? Well... If it was easy, everybody'd be doing it. I am lucky. Halia's breeder put me in touch with a breeder on the East coast who helped me select a male for breeding, based on his personality traits. We tried and came up empty, the insemination didn't take. Next heat came, and... success! Halia gave birth to a girl and three boys. Hopefully one of them would have "the right stuff" to be a service dog. At 8 weeks we had them evaluated for aptitude to become service dogs. ALL THREE passed! the rarity of a 100% success rate in a litter is staggering. I should've bought a lottery ticked the day Halia was impregnated. We decided to put two into training programs, and the third one, which we named Polar Bear, we kept. We'd planned to keep a boy for some time, and we've also found him a mate--Nani Lelani (Beautiful Flower.) Nani is just a few months older than Polar Bear, and we're expecting very good things from the two of them in a few years. We are producing QUALITY, genetically sound, AKC registered Labradors with AKC Champion bloodlines. We select, raise, and breed our girls (and one boy) to produce very high quality pups. Even then, we realize that not all of these dogs are going to become service dogs, but even those dogs will make phenomenal pets for loving families. Dogs of this caliber easily sell for $2500 (or more, if I got some champion letters behind Halia's name.) So naturally, we select service dog training programs worthy of our dogs--and we give these dogs to them, free of charge, with only their guarantee that they train them and donate them to either a disabled veteran, wounded warrior, or first responder (or their family members) who need them. It costs training programs NOTHING to receive one of our pups. 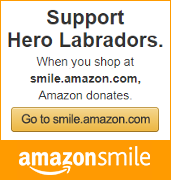 Hero labradors has zero paid employees, we're all volunteers. Service Dogs for those who've served. Thank you for your service, your dedication, and for continuing to give even when you needed help yourself. You are a hero!